Welcome to The FX Lab. The purpose of this site is to provide resources for both professional and amateur special effects sculptors, makeup artists, mask makers, designers and enthusiasts. The Lab is intended to help artists learn new techniques and share their work in a positive and collaborative way. We are presently restructuring the site but please check out the various sections, as they become available again. The Forum portion of the site is being replaced by a different format. Please excuse the minor link inconsistancies during the revamping process. To see more info on what we're doing, click the Forum link. The Gallery is where we showcase some of the best work of various artists. In The Study, we have articles written by Lab members on many FX topics, and also other informational resources. Also take a look at the Links, where we will not only link to other useful sites, but also put up various things relating to the members of this site, including collaborative group projects. 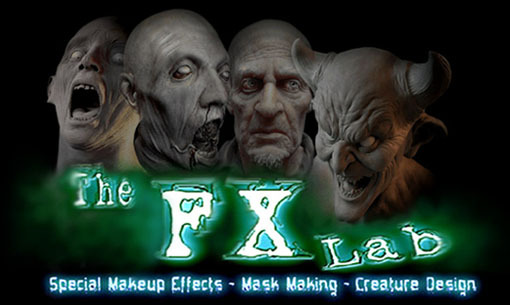 The techniques and processes described and discussed at The FX Lab are provided in good faith. The health and safety of readers attempting anything described at "The FX Lab" are the sole responsibility of that person and/or persons. Authors of tech articles in the FAQ section assume no liability whatsoever. It is very important to familiarize yourself with, and practice the standard safety precautions when working with materials such as polyfoams, urethane resins, plasters, etc. Contact your product suppliers for Materials Safety Data Sheets and follow the prescribed precautions. Those under 18 should not work with such dangerous materials without adult supervision, if at all. All images, designs, characters are copyrighted by the artist unless otherwise noted. Special thanks to Christian Hanson.